Well into fall, the ride has come to a full and complete stop. This weekend our favourite theme park closes its doors, slamming them shut on thrill-seeking fun until next year. No more Tiny Toms or over-priced pizza slices or exhilarating coasters rides until next year. My son and I LOVE thrill rides. It’s something special we share. Every year we ride the rides from opening until dark. My husband doesn’t do rides. My daughter loves them and would happily plummet and spin and hang upside down, though she’s big on courage, she’s little in body. So in the spring, we take her to a family theme park called Centreville where she can experience rides just perfect for her. The only thing I don’t enjoy about some parks is the line-ups. Patience is not one of my virtues. The fast-pass ticket system at Disney is the way to go—for no extra charge you can print a ticket for your favourite ride and avoid lining up. 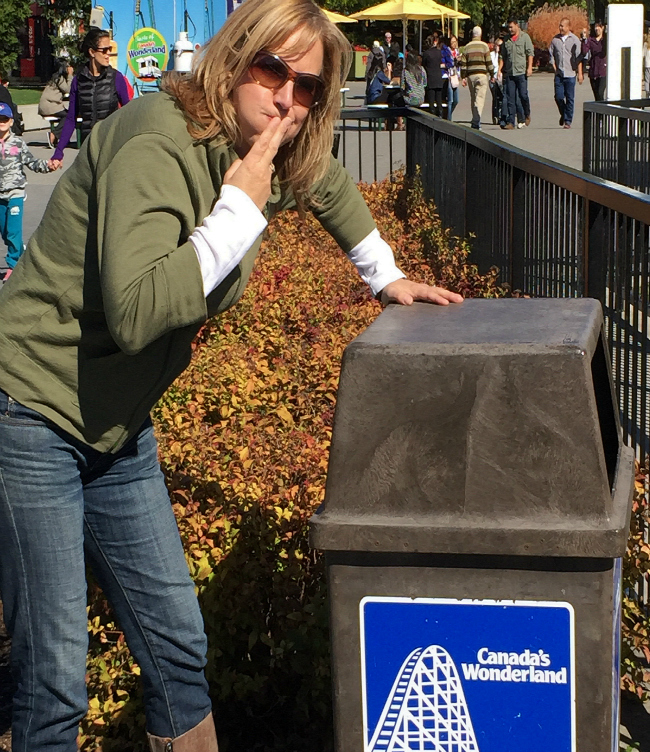 At Wonderland, a park near us just north of Toronto, you have to pay extra for a fast-pass. Will I ever visit this Halloween Haunt? Not a chance in hell. I’m already afraid enough of zombies, spiders and psychopaths, why make it worse? So that left epic roller coaster lines wide open! We rode the breathtakingly high Leviathan, the bullet fast Behemoth (twice! ), the Bat, the Sledgehammer… all of them. Well, all the ones that wouldn’t hurt my back. How sad is that? 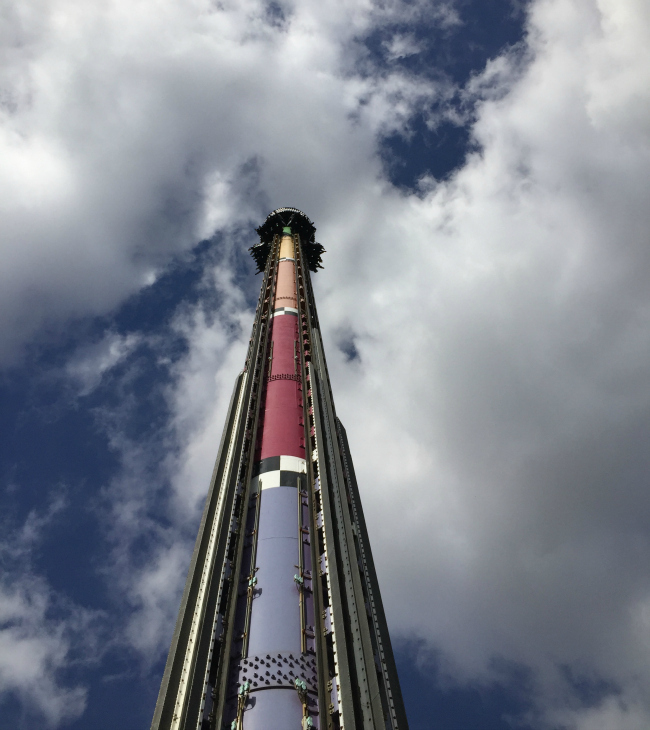 I can no longer do the stand up coasters because the jarring turns jostle my head and spine so much I can literally see my chiropractor’s finger wagging at me. The other thing I noticed was a new aversion to spinning. This first happened on the tea cup ride at Centreville. I used to love to spin and twirl. The faster, the dizzier, the better. But this time was different. I was literally three spins away from Linda Blairing all over the ride attendant. It took me a full hour to tame the bile that was threatening to erupt at any moment. I had hoped it was the result of a pre-spin veggie dog/coffee combo. 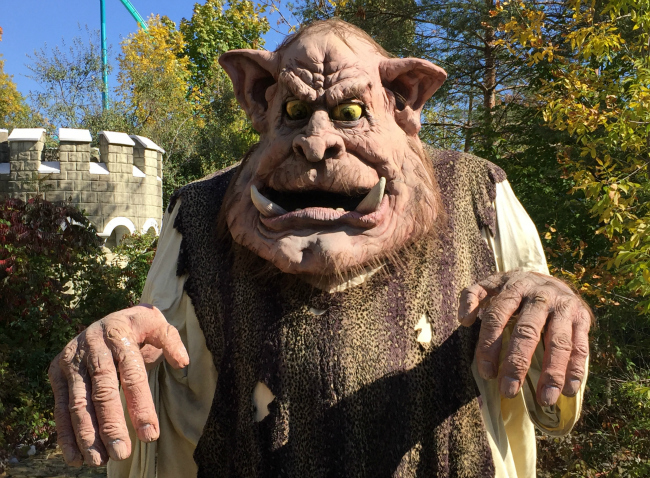 However, a turn on that ride—you know the one where you stand and spin and the resulting gravity pins you against the backrest— made me look like this. Apparently as you age and your equilibrium shifts, your body no longer enjoys being tousled around like a sock in the dryer. Low rise jeans, lip piercings, uptalking and now spinning it seems are better suited for the young. The only other ride we bypassed was the Drop Zone. Not anti-spinning related, but on account of it being INSANELY TERRIFYING. However… if we did it, we could say we conquered the park. Bragging rights alone made it worth the risk. I wasn’t concerned so much with dropping to our deaths more about having a blood vessel burst somewhere in my body. “Did I take my blood pressure meds this morning?” I asked myself as we were hoisted into the atmosphere. And we laughed our heads off. And there were multiple high-fives. See you again next year, thrill rides! Not mid-summer of course, but on a quiet off-season-ish day, we’ll be back for more. Who’s coming with us?